Our hallmark is top-quality individualized horse care -- horses are all unique, and the cookie-cutter approach to care isn't in the best interest of the horse or horse-owner. We board 6 different and distinct categories of horses each with their specialized needs: 1. Breeding herds (including stallions); 2. Rescue horses; 3. High-performance, competition horses; 4. Geriatric horses (retired or still working); 5. 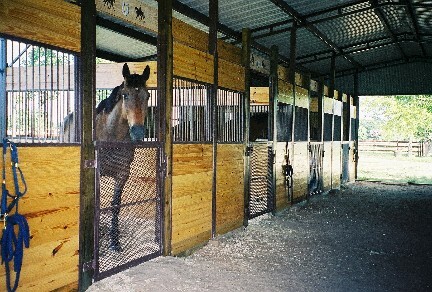 Rehabilitation horses; and 6. Hospice horses. To speak to individual horses' needs, we have created the largest variety of feeding, stall, and turnout options of any facility in the Houston area. We have five different stall sizes (from 8x12 to 12x20), stalls with turnout areas attached (for arthritic horses that must constantly move), and nearly 40 turnout areas ranging from a 10-acre grassy pasture to a 12x12 area used for rehabilitating injured horses. * $425 Board includes: fan electricity, blanketing, electrolytes, salt block, individualized feeding program, trailer parking, coordination of farrier and vet and de-worming, and selected medical treatments. Individualized feeding program available from many types of feed including: Evann's Local Feed (many varieties), Purina Equine Senior, Purina Strategy, Triple Crown Low Starch, Nutrena Safe Choice, Wendlands One N Only, Country Acres Pellet Sweet Feed or All Grain, and more. Please visit our photo gallery to take a closer look! To inquire about availability or for more information, please contact Heidi by info@allhearthorsefarm.com, or by calling 713-515-1261. Copyright © 2004-2016 All Heart Horse Farm. All rights reserved. Created: August 2004.